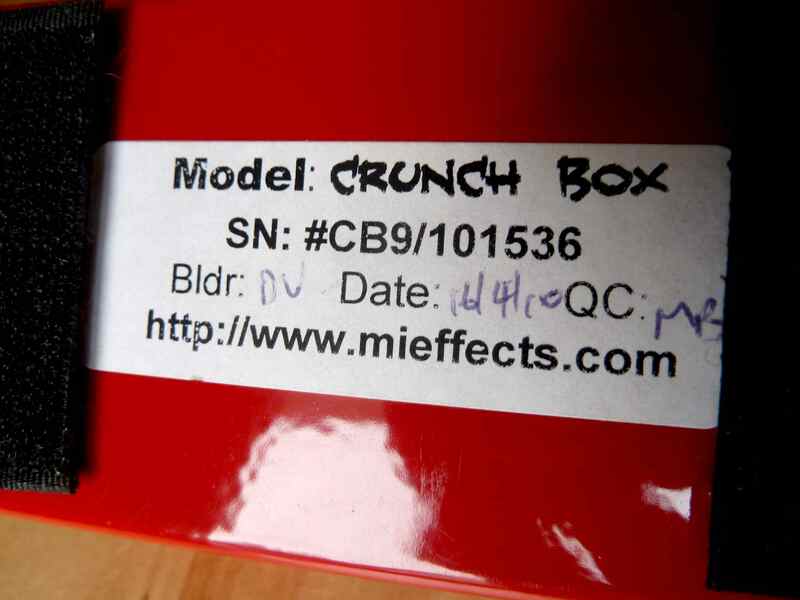 Crunch Box, Distortion from Mi Audio. 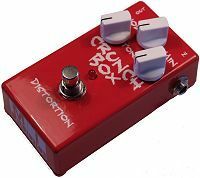 I was a huge fan of the Crunch Box V.2 pedal for years and I probably bought and sold 3 or 4 of them. It was an addicting pedal. A lot of overdrive pedals boast this kind of feature set. The traditional tone, volume, gain controls with the "marshall in a box" sound. In fact it's become such a popular theme in overdrive pedals that there's almost too many to count. I am a big fan of marshall or "british" overdrive tone so I am always on the lookout for the best marshall flavor pedals. 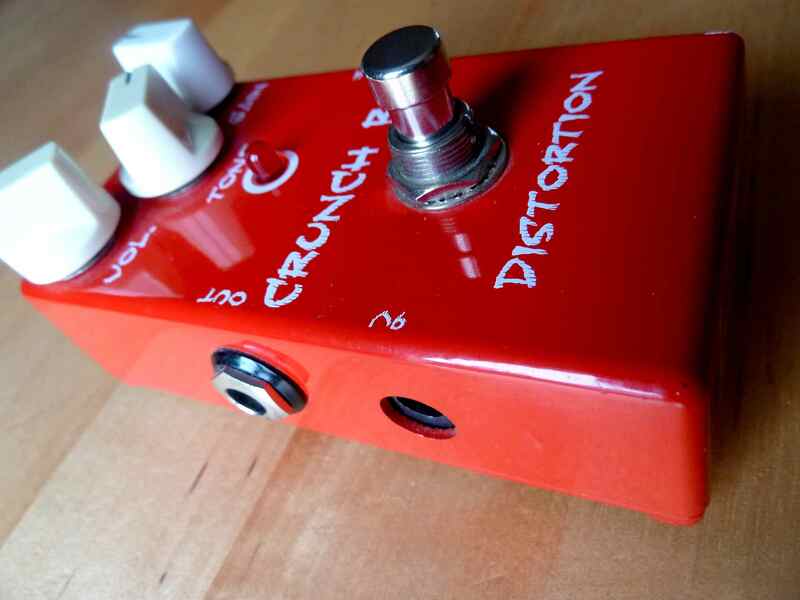 In the past my favorites have been the crunch box, the Catalinbread DLS, and the Radial hot british tube overdrive. A lot of people also like the Fulltone OCD but there are so many versions it can get confusing knowing which to get. 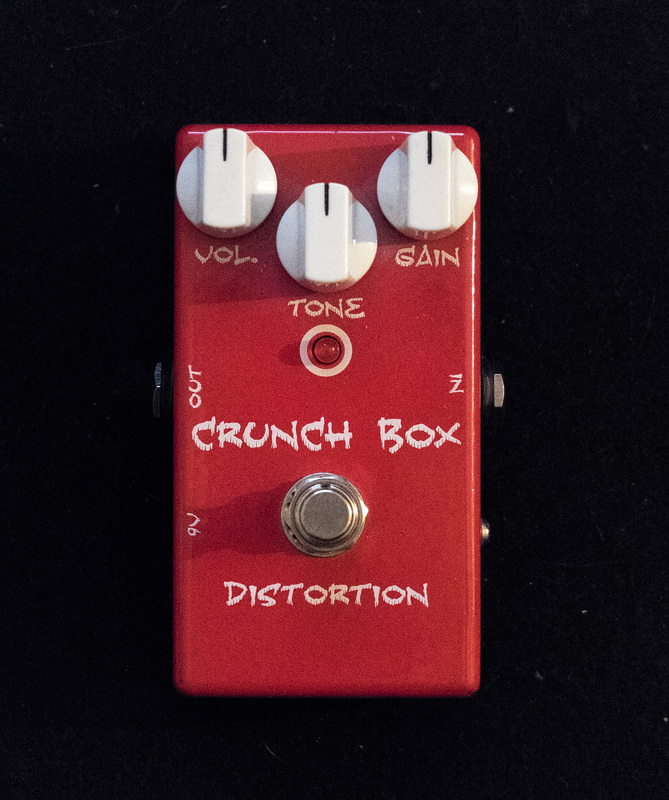 The 3rd revision of the Crunch Box doesn't look too much different than 2. I've got to say it feels a little cheaper than the old ones. Time will tell how reliable it is. It seems solid enough. The jacks I'm afraid might go on me eventually. The big problem with these marshall style overdrives is they generally fall into some flavor of either plexi or jcm territory. The plexi ones tending more more dynamic classic rock tones and the jcm style pedals going for the 80's thing. Some pedals like the DLS try to do both. I feel like the Crunch box is somewhere in between. Think hot-rodded plexi tone. It has a very pronounced upper midrange. Even more than the 2nd version. I haven't tried adjusting the internal trim because I think I'm pretty happy with where it is now. These have gotten more expensive as they have gained popularity. I remember when it was a pretty under the radar pedal. I would say in the under $150 range it is one of the best marshall style overdrives you're going to find. Honestly there are so many flavors nowadays that you just have to choose one you like. 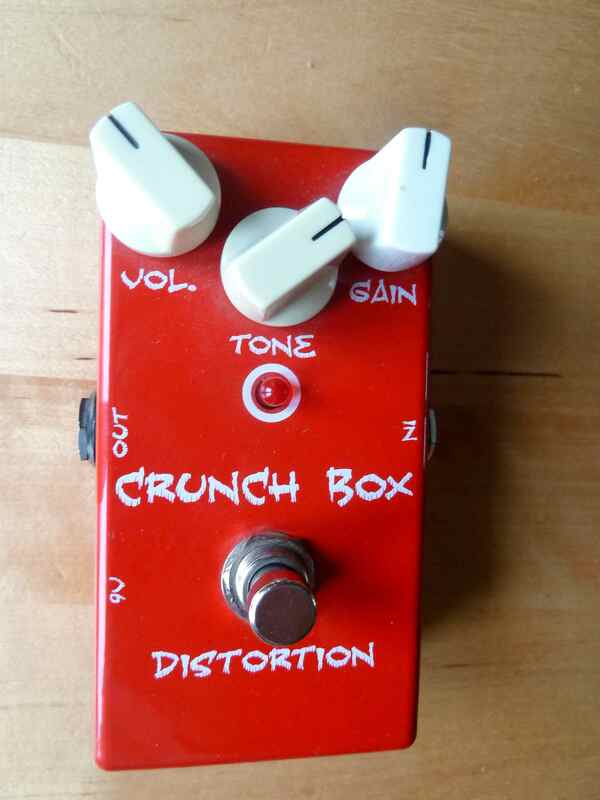 I feel the crunch box is best for the heavier AC/DC Zeppelin tones. It's not quite modern enough for the high gain 80's stuff but it does have gain on tap..don't be mislead. Great pedal. Try it. badgerific's review"Marshall tone in box." This is a distortion stompbox, it's all analogue circuitry housed in a solid cast metal case. This unit isn't rackable or editable using a computer. 1/4" in jack, 1/4" out jack, standard boss power supply adaptor and internal 9v battery snap. Three external controls: Volume, Gain and Tone. True bypass to avoid tone coloration when the effect is disengaged. This pedal is easy to set up, standard cable between the guitar and pedal then from the pedal to the amp and stick a battery inside and you're ready to go. I find this pedal very easy to manipulate to produce interesting tones. All of the controls are very interactive. The internal Presence trim pot is very useful to help match the tone of the pedal to amplifier depending on how dark or bright it sounds. I think there's a good range on all of the knobs which allows you to dial in a good range of tones. The tones that can be created with this pedal range from a slight drive with the Volume pushed up and the Gain backed down to a huge cranked marshall tone with the Gain control at maximum. One thing I really like about this particular pedal is the way it reacts with what guitar you plug into it, when used with a guitar with low output pick ups such as a Fender Mexican Standard Stratocaster the gain needs to be pushed a lot more than if something like a Les Paul is used. This pedal uses LEDs as clipping diodes which provide a very middy distortion which I really like the sound of. I think this is a great pedal for some looking for a good sounding Marshall crunch tone for a reasonable price without getting a new amplifier. Dominique Le Bars's review (This content has been automatically translated from French)" Good price / quality ratio"
Quite rich in harmonic effects but without being really convinced. Pedal used to magnify the light saturation of my amp or live on the clean channel. The race knob is rather long and has a nice reserve distortion. I found him a grain not realistic enough and too synthetic. I 've since found my happiness in overdrive. Effect that is more suited to my style. So little versatility in the end. trb's review (This content has been automatically translated from French)" very well"
Its a very good Marshall grown well, relatively compressed from the third race. Generous level of output, the knob are progressive. One can draw a "crunch" to 1/4 then it leaves distortion touours angry but well controlled and clean, no drooling. adjustment of highly effective tone (in connection with the internal trimpot) and chenge radicaelement texture distortion. My model to the small internal trimpot, very effective. But these knuckleheads put it in the box, then it should still be accessible as it affects very strongly on the tone adjustment control with a significant presence. So adjust according to the amp but els scratch. I am considering a mod to remove it (see post MOD on U.S. forums). if in the end a very good pedal that is kept. FYI I also NEO FUZZ MiAudio of which is also excellent. The Crunch box is a very good complement with RiffSHooter to judge Fred I also (also top this one!) And 2 provide texture crunch / distortion very different.